It’s finally Friday! Hooray! That means I finally get to show you Marathon Mouse! Also, I will be announcing the winner of Monday’s giveaway signed copy of Marathon Mouse at the end of the post (I know – so much excitement!) so stay tuned! 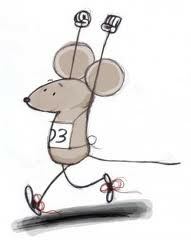 Brief Synopsis: Preston Mouse lives beneath the Verrazano Bridge and dreams of running the New York City Marathon. “Mice were not made to run,” says Papa. “A mouse could get crushed,” says Mama. “You? Run 26.2 miles?” his sisters tease. With this lack of faith, Preston trains secretly, but train he does because he believes he can do it. At least, he wants to try. Links To Resources: Teacher’s Guide from author’s website. Also I think reading this story gives an excellent opportunity to discuss with kids what they dream about – what do they think they can do? what do they hope to accomplish? Younger kids can draw pictures of themselves working toward or achieving something that matters to them. Older kids can write a story about it. Discover Marathon Kids. And a little about the first marathon and some related activities HERE. Please email me (by using the handy button on the side or by actually, physically, manually typing in susanna[AT]susannahill[DOT]com) and tell me your address and (never mind, Jarm – I have it from the PPB book mark mailing!) how you’d like Amy to sign it, and we’ll get it straight out to you! So, have a nice weekend everyone! Oh, you think I forgot something? Okay. You twisted my arm. I’ll tell you who won the Halloweensie Contest. And let me just say – it was quite the nail biter! But the voters have spoken! Oh. I guess we better have trumpets AND a drum roll this time. Wait! Maybe we should also throw some confetti, wouldn’t that be nice? Cake, anyone? Something festive and Halloween-y? Second place and a $25 Amazon gift card goes to Laura R for Jack O’Lantern! Third place and a $15 Amazon gift card goes to Nancy for Halloween Drives Me Batty! But I’d like to say again how fabulous ALL the entries were, and congratulate everyone who entered. You all did a great job, and I know how hard it is to put your work out there, so BRAVO!!! I know I speak for everyone when I say how much we all enjoyed reading ALL the entries! Okay. Now for real, go have a nice weekend 🙂 PPBF bloggers, please remember to add your post-specific link to the list below! Congrats to you too, Rena, for a great entry! What I love about today's list of books is that I've only heard of 2 or maybe 3 of them. The rest are all brand new to me. Lots of reading to do! The Marathon Mouse sure sounds like a book I'd like. Dream big or go home. Dreams are what makes the world go round. Congrats to Julie and to all the other brave entrants. The way you dragged out the announcement made me chuckle. I know you loved every minute. Mice AND running? I LOVE it. I'm pinning this. Thanks, Susanna. I must get my hands on Marathon Mouse. I'm off to convince my library to order it. And congrats to all the contest winners. I loved reading the entries. 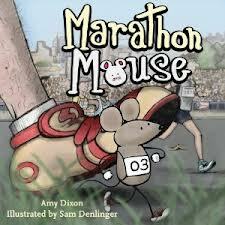 Marathon Mouse sounds like a wonderful story with an important message! Congrats to Julie, Laura, and Nancy! Thanks again for hosting such a fun contest Susanna! Ooh! This book looks adorable. So glad to finally hear about it! Thanks Susanna! I am rather picky when it comes to picture books, and this one is really a gem. I hope you like it 🙂 Thanks so much for stopping by, Caryn! I'm glad you liked the review and hope you'll enjoy the book. It's very sweet with a lovely message. Have you ever been to the NYC marathon? It's quite the event! I'm not a huge mouse fan, but you're right, he is adorable! And I, like you, am a sucker for “work hard to follow your dreams” type books.